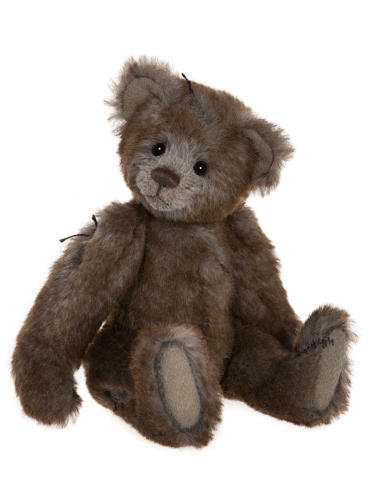 This gorgeous fully jointed small bear which has been created using a blend of Alpaca and Mohair in what Charlie likes to call vintage film reel browns. (She loves her paint colour cards as you all know and is always creating new names for colours!) is traditional in style, he has canvas paw pads and oodles of extra hand stitch loose thread detailing to create our “tear and repair” preloved look. He has tiny glass eyes and a handstitched nose. No accessory has been added to this little one. If you like this bear then you should also check out their bear family Bergman, Bogart, Clooney, Hepburn, Heston, Sylvester, Washington.